500mm one piece cone complete with D2 reflective sleeve. Manufactured from recycled material. ..
750mm one piece cone complete with D2 reflective sleeve. Manufactured from recycled material. ..
750mm two piece road cone come complete with a reflective D2 sleeve. 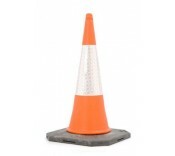 The centre cone is blow mo..
1m two piece road cones come complete with a reflective D2 sleeve. The centre cone is blow..
Our Blue Road Cones are often used in various types of corporate branding. The master con..
Our Green Road Cones are used to indicate the entrance and exit to work sites from carriageways.&nbs..
Our Yellow Road Cones can be used in various types of corporate branding. The master cone..
Our Danger Overhead Cables Road Cones are used to identify overhead power lines. The mast..
Our Blue Road Cones are often used in various types of corporate branding. The master cone is ..
Our Green Road Cones are used to indicate the entrance and exit to work sites from carriageways..
Our Yellow Road Cones can be used in various types of corporate branding. The master cone is o..
Our Danger Overhead Cables Road Cones are used to identify overhead power lines. The master co.. The Street Works and Road Works legislation deems that all reflective signs must conform to BS EN 12899-1 or BS 8442. In this context, road cones are treated the same way as road signs and should be reflective to the correct standard. Also under this legislation, a minimum size of cone for use in works was highlighted in this act (see below). In our range of road cones we have both the one-piece and two-piece style, the former being robust heavy-duty style, favoured more by contractors and local authorities and the latter by traffic management companies. The one-piece road is manufactured from recycled thermoplastic material and the two-piece cone has a blow moulded centre, manufactured from a tough, specially formulated polyethylene with the base made from a tough recycled material. The smaller 450mm and 500mm cones are to be use on roads up to 40mph. The taller 750mm and 1000mm cones can be used on all single or dual carriageways, where the speed limit can be 50mph or more. Special discounted rates are available for pallet quantities.